The following articles are courtesy of Intelsat General Corporation and are authored by the SatCom Frontier editorial department. missile warning; nuclear command, control and communication; the Global Positioning System; space situational awareness; satellite operations; space launch; and range operations. Wearing his other hat, General Buck also directs all assigned and attached USSTRATCOM space forces as the Commander, JFCC for Space. His office provides tailored, responsive, and synchronized theater and global space support of national security and combatant commander objectives. His operation is also responsible for protecting and defending critical U.S. and allied space capabilities. Overseeing two large military organizations is no easy feat, but General Buck brings a wealth of experience to his roles. He received his commission in 1986 as a distinguished graduate of Officer Training School. In addition to a variety of command, test and evaluation, and staff assignments, General Buck’s operational experience includes missile operations, space launch and range operations, satellite command and control, space force enhancement, and space control. 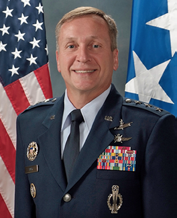 Prior to assuming his current position, General Buck was first the Director of Operations, then Vice Commander, Air Force Space Command. As a result of holding these two commands, he is “in position of not only organizing, training, and equipping space forces, but also being a main point-person for the space part of any military operations,” Space News said in a recent article. 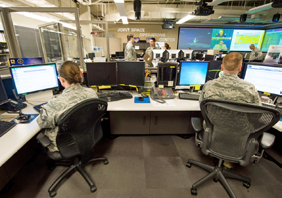 When a military unit needs space support, it submits the request to the Joint Space Operations Center (JSpOC). Airmen of the Joint Space Operations Center (JSpOC) at Vandenberg Air Force Base monitor computer systems designed to detect, track, and identify all artificial objects in Earth's orbit at Vandenberg AFB, Calif, Sept. 27, 2014. Its mission is to provide a focal point for the operational employment of worldwide joint space forces and enable the commander of Joint Functional Component Command for Space to integrate space power into global military operations. Photo is courtesy of U.S. Air Force — Airman 1st Class Krystal Ardrey. In addition to overseeing day to day operations, General Buck is thinking strategically about the U.S. military’s future space capabilities. For instance, the JFCC for Space is tasked with assessing the Commercial Integration Cell (CIC) project. The CIC is a pilot program to determine how information sharing and collaboration between the Department of Defense and commercial satellite operators can be improved (please see the sidebar regarding CIC). General Buck is also strategizing the best way to beef up the organizations’ intelligence capabilities. “To me, intelligence drives operations, and we have to get ahead of adversary actions,” he said at the AFA event. “Just like every other domain, I need domain awareness: knowledge of who, what, where, when, and why.” To this end, General Buck is working with the Air Force Deputy Chief of Staff for Intelligence, Surveillance, and Reconnaissance, Lieutenant General VeraLinn “Dash” Jamieson. Together, they are trying to determine the best way to attract intel personnel to space career fields. General Buck’s efforts to collaborate with commercial satellite partners and achieve an intelligence advantage illustrate his long-range view of the importance of space in military operations. Intelsat General partner Kratos is producing Constellations, a podcast featuring top influencers in satellite and new space. 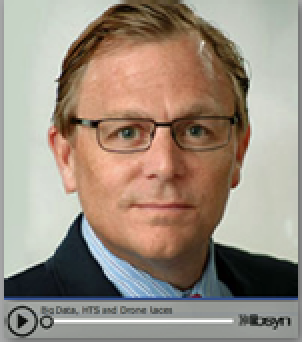 The first edition of Constellations features the President of Intelsat General Corp., Skot Butler, and is entitled "Big Data, HTS and Drone Races." Select Skott's photo to hear the interview. Skot talks about the concepts involved in “new space” and where Intelsat fits within the larger picture. He presents a high-level overview of innovations in space and on the ground as they relate to Big Data, the Internet of Things (IoT) and mobility. This includes how HTS and small, flat panel antennas are combining to enable rapid decision making in aviation, maritime, and other critical operations. 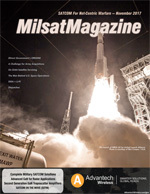 Listeners will also learn how Intelsat is providing global satellite coverage through its partnership with OneWeb to enable connectivity in the air and on the ground. Listeners will learn how the form factor of antennas is evolving, how antennas are making it easier to join the network as well as gaining a sense of the scope of the data being transmitted by IoT today and in the future. CIC allows satellite operators from commercial companies to sit alongside military personnel at the JSpOC. The goal is to enhance the JSpOC commander’s situational awareness of the space domain and develop tactics and procedures for combined operations, helping achieve a better integration of commercial satellite operators and the warfighter. The CIC is a pilot program to see how information sharing and collaboration between DoD and commercial satellite operators can be improved. This program is being operated under Cooperative Research and Development Agreements (CRADAs), which are approved by the Air Force Research Laboratory (AFRL) and address technology transfer challenges between Air Force activities and commercial collaborators. The CIC collaboration seeks to improve conjunction assessment and space object catalog maintenance; enhance rapid identification, diagnosis and resolution of RFI events; identify on-orbit anomalies; and increase overall resilience of government and commercial satellite operations. One particular focus was on exploring the possibility of machine-to-machine interfaces for the exchange of “ephemeris data,” numbers that indicate exact spacecraft locations. Six commercial companies participated in the CIC: Intelsat General Corp., SES-GS, Eutelsat-America, Iridium, Inmarsat and Digital Globe. Intelsat General helped craft and perform the concept of operations (CONOP), working as an integrated member of the DoD. Relationships were built, procedures learned and contingency plans for space jointly developed. The CONOP was performed as part of the recent Schriever War Game and the increased optimization of space assets and additional resiliency shown was judged a huge success. The Wargame, which was set in the year 2025, explored critical space issues, such as spacecraft jamming to cyber warfare attacks on ground-to-space control infrastructure and the use of anti-satellite weaponry. The value of a commercial presence inside the JSpOC cannot be overstated. There is the obvious value of improved satellite catalog accuracy and faster, more secure coordination and resolution of interference events. The CIC pilot has laid the groundwork for sustained, combined operations and clearly paved the way for an enduring relationship as true mission partners. This closer partnership is critical, not just in peaceful times but as preparation for potential times of threat. Placing commercial personnel on the inside greatly improves military and commercial communications by mitigating problems before they occur and increasing response time. Joint Functional Component Command for Space (JFCC Space) will now assess the CIC program and establish the framework for further collaboration. Tim Turk believes the success of the CIC demonstrates the immense potential represented by closer military and commercial coordination of space assets. As the program continues, the JFCC for Space is establishing a framework for further collaboration.